Charles Unbehaun 1925 ~ 2018. Charles W. Unbehaun Jr., age 93, surrounded by family, peacefully passed away November 4th in the Charlevoix, Michigan home he shared with Christine (Chris) his loving wife and best friend of 45 years. Chuck, as he was fondly known by his many friends, is survived by Chris, their five-children (between them), fourteen grandchildren and several great-grandchildren. Chuck was born June 4, 1925 in Buffalo, NY, to Charles W. Unbehaun and Helen Louise Burpee Unbehaun. He had one sibling, an older sister, Louise Emily. 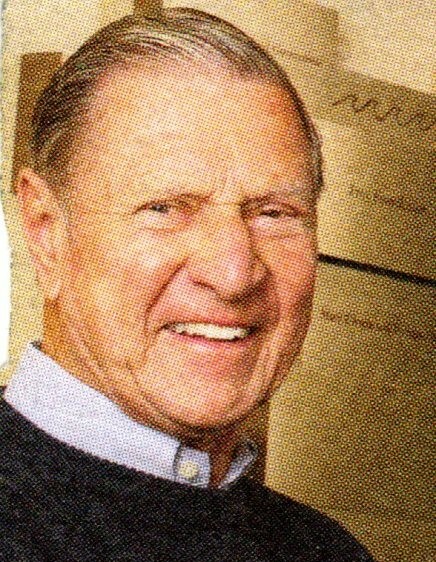 Chuck grew up in Buffalo, graduating in 1942 from LaFayette High School, where he was the Senior Class President and Valedictorian. He had several college opportunities, selecting the University of Michigan to study Mechanical Engineering where he became a member of the Sigma Chi Fraternity. In 1943, at the end of his first semester, at age 17, Chuck enlisted in the U.S Naval Reserve Training Unit at the U of M. At Michigan, he dually completed his Naval Officer Training and his Bachelor of Science Mechanical Engineering degree in February 1946. Though the war had ended in August 1945, Chuck went to Newport, R.I. for Seaman's training followed by an Ensign assignment on the U.S.S. Columbia. Chuck retired to civilian life in the fall of 1946. The family would like to express a special thank-you for the extraordinary care Chuck received while at home in hospice. They would like to acknowledge Chuck’s nurse of two years, Jennifer Reeves, of the Charlevoix Health Department of Northwest Michigan. If you would like to make a contribution In honor of Chuck’s life, the family requests that donations be made to either the Charlevoix Area Hospital Foundation or Hospice of Northwest Michigan.